All is grist for Miller's mill, which is to demonstrate the significance of this seismic cultural shift for theological method, doctrine, belief, community, and theological anthropology. Consuming Religion takes a critical stand against the deleterious effects of consumerism, but it also strives to consider certain positive aspects of the transformation of religious faith and practice that have accompanied the rise of consumer culture, aspects such as the explosive growth of popular agency. - Publisher Consuming Religion surveys almost a century of scholarly literature on consumerism and the commodification of culture and charts the ways in which religious belief and practice have been transformed by the dominant consumer culture of the West. Vincent J. Miller is Assistant Professor of Theology at Georgetown University. 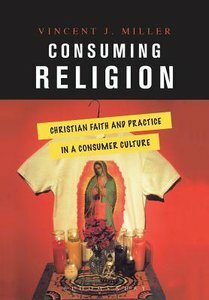 How To Think About Consumer Culture; The Commodification Of Culture; Consumer Religion; Desire And The Kingdom Of God; The Politics Of Consumption; Popular Religion In Consumer Culture; Stewarding Religious Traditions In Consumer Culture.